THE VOICE: Post Super Bowl Show, Contestants Talk! NBC premiered it’s second season of singing competition show, “The Voice” yesterday after the Super Bowl XLVI and with it, the first few stand-out contestants were introduced to the world. In a conference call this morning with all five of last night’s contestants, they talked to HOLLYWOOD JUNKET and other reporters candidly about their experience on the show so far and their singing backgrounds. Contestants that made their television debut last night and were successful at joining one of the four celebrity mentors (Christina Aguilera, Cee Lo Green, Blake Shelton, Adam Levine) are: RaeLynn (Team Blake), Tony Lucca (Team Adam), Jesse Campbell and Chris Mann (Team Christina) and Juliet Sims (Team Cee Lo). The contestants all had different reasons for choosing to compete on “The Voice” over other singing competition shows. Chris Mann whose style is a cross between pop contemporary and classical said for his music, he just wanted a platform to sing and that with “The Voice”, “It takes away the whole thing of what needs to fit into a box. It allows the craft to come through”. Mann also stated that the reason he chose to be on Team Christina is because “In the end, I had to go with my gut and my dream come true which is to work with Christina”. RaeLynn whose style is a very distinct and original country sound said that she started singing at a very young age. She was involved in a Cristian rock band and would sit in her room and play the guitar and sing. “I spent so much time with my voice and sang every day”. Juliet Sims with coach Cee Lo Green. The moment that indie rocker Juliet Sims took the stage, all judges except Shelton, know that they wanted her. Viewers saw what was an intense moment between Levine and Aguilera where that made their arguments of why Juliet should pick them while making personal attacks on each other. We asked Sims what her thoughts were at that moment as they fought over here. Sims said she didn’t want to fall over because she was wearing 8 1/2 inch heels on stage. “It was a pinch me moment. I had my brother pinch me. I couldn’t believe that, that just happened. It seemed like I was up there for 20 minutes, though it was much shorter than that”. We also asked her if their fight had anything to do with why she chose to go with Cee Lo Green. Sims response was, I felt like Cee Lo was this wizard with something up his sleeves. If just felt right with what he said. Hearing the story of his life and my life, he seems to have a master plan and I want to see what that is”. 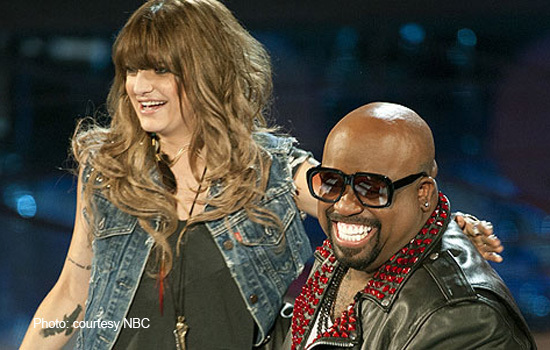 “The Voice” will air again tonight on NBC at 8pm where more contestants will be chosen by the mentors.